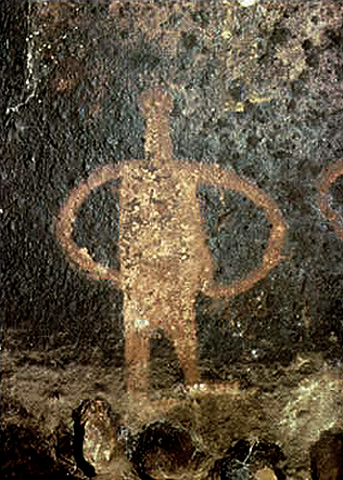 This section came about as a result of another preservation and protection project in Africa with the mould and cast of the life-size giraffe petroglyphs in the Air Mountains in the Sahara. In 2001 the Bradshaw Foundation installed an edition of the cast at the National Geographic Society's Explorers Hall for their exhibition 'AFRICA'. The cast is now a permanent exhibit at the Explorers Hall, Washington USA. At this time I met J.Michael Fay who had recently returned from his Megatransect through Western Central Africa. Having just seen a documentary of his epic journey/expedition in which he draws reference to stone age cultures in this region, I enquired about the existence of rock art. Mr Fay put me in touch with Dr Richard Oslisly, of the Institut de Recherche pour le Developpement and the Institut de Paleontologie Humaine in Paris, who has worked in this region of Africa for numerous years. I then met Dr Oslisly at the Institut in 2002 where we agreed that a new section on Western Central Africa's rock art was important for two reasons: much of the rock art is still being discovered today, and thus further discovery and documentation is vital. Moreover, this region appears to have been a major conduit for migration over a long period of time and therefore important in understanding the overall picture of population, migration and cultural influence in Africa. The Western Central Africa section is categorized by location rather than by style or age: Gabon, Central African Republic, Cameroon and Congo. 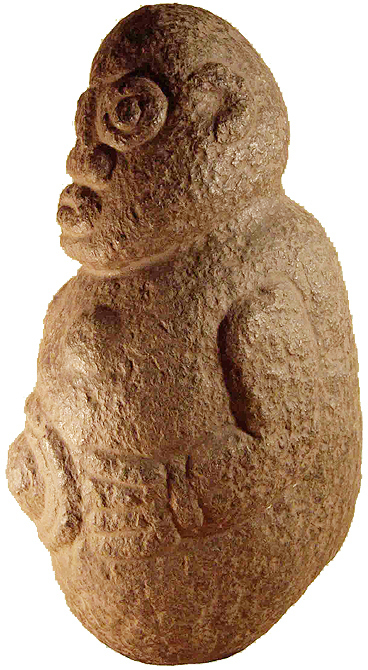 The 5 figurines are from north-western Cameroon - Oku, Kumbo and Jakiri. Chronology - possibly 1000 to 500 years old. Préservation et Valorisation des Patrimoines Naturels et Culturels en Afrique Centrale.